Meanwhile, the ANC says once the land is under the control of the state, legislation on redistribution would be necessary, instead of having a ‘free for all’ situation. The Economic Freedom Fighters (EFF) have promised to stay at the forefront of land expropriation without compensation and land redistribution, saying the latter should be implemented proportionally according to the demographics. 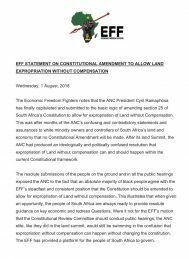 In a statement noting President Cyril Ramaphosa’s announcement on Tuesday evening that the ANC would support an amendment to section 25 of the Constitution to make land expropriation without compensation legal, the EFF committed to consistently provide ideological and political guidance on the issue. 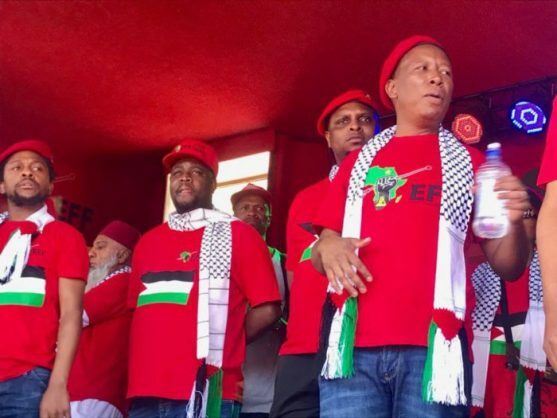 “The people of South Africa should rest assured that with the EFF at the forefront, all South Africa’s land will be returned to its rightful owners, and the settlers and their descendants will be allocated proportional to population size in South Africa,” the party said. Speaking on eNCA’s Tonight with Jane Dutton on Tuesday evening, EFF deputy president Floyd Shivambu said once land is under the custodianship of the state, its redistribution should reflect the demographics of the country. “Because the black African majority constitutes 80% of South Africa, they should occupy 80% of South Africa in terms of land ownership and control, and then will see then how the other racial categories get to occupy land in South Africa,” Shivambu. The EFF second-in-command added that once the Constitution has been amended, legislation on land distribution for different uses, including residential, agricultural or commercial purposes, would be necessary. Noting Ramaphosa’s announcement, the EFF said the president had “capitulated” to calls for amending section 25 of the Constitution, allowing the government to expropriate land without compensation. 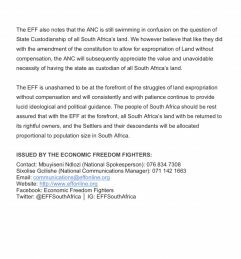 “This after months of the ANC’s confusing and contradictory statements and assurances to white minority owners and controllers of South Africa’s land and economy that no Constitutional Amendment will be made,” the EFF said. The red berets said the ANC’s resolutions taken at its land summit recently had been ideologically and politically confused because they called for land expropriation without compensation to be implemented within the current constitutional framework. Meanwhile, providing clarity on Ramaphosa’s Tuesday announcement, the ANC said it would not be ”a free for all” situation after the amendment of the Constitution. ANC national executive committee (NEC) member Ronald Lamola, tasked with matters of land reform, said it was a ”myth” that land would be freely available in South Africa. “It is not true that you will wake up tomorrow and all land which will be in the hands of the state will be available for free to everyone, it does not mean all South Africans will wake up and have land. There will still be a need for legislation as to how we are going to distribute land. It does not mean that everyone will walk into free land, it is not free,” Lamola told reporters in Johannesburg, following the party’s two-day lekgotla held in Irene, Pretoria. He added that should land be nationalised and available for free, the state would be taken to the Constitutional Court, where it could be found to have been unjust and inequitable. Lamola said the state would lose and be ordered to pay billions of rands in compensation, “which government does not have”. “So we are not nationalising, but distributing. We are giving land to those who will use it. If we give you a farm or an RDP house, you will get a title deed. We are not nationalising the land in this country, because if we do that we will also be dispossessing land from black people who already have land, we can’t nationalise houses or people’s pieces of land,” he said.